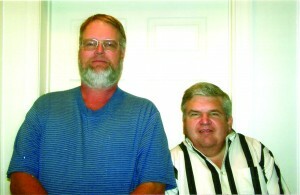 Pictured are Anthony and Chad Johnson, sons of mesothelioma victim Marlyn Johnson. Marlyn Johnson spent more than 20 years during the 1960s and 1970s as a carpenter and general contractor. During this time, he worked with and around others who applied and sanded asbestos-containing joint compounds while building more than 200 residential homes. Due to breathing asbestos fibers from the joint compounds over time, Mr. Johnson was diagnosed, suffered terribly, and subsequently died from malignant mesothelioma, an incurable cancer caused by breathing asbestos dust. Through the testimony of Mr. Johnson’s co-workers, doctors and his family, Alan Pickert and Anita Pryor of Terrell Hogan were able to achieve a measure of justice and substantial compensation for Marlyn’s two surviving adult sons, Anthony and Chad. Chad, who suffers from Muscular Dystrophy and Klippel-Fiel syndrome, testified about his own surgeries and invasive treatments over the years, after which his Dad was always there to care for him. Anthony, now 49, recalled visiting his father’s work sites beginning at around age 12 and seeing the containers of asbestos-containing joint compound to which his Dad was exposed.